Prosperity Student Living Derby – a joint venture between Prosperity Capital Partners Ltd and London and UK Property Ltd – has agreed a £20.3 million forward funding deal with Aviva Investors REaLM for a new student accommodation development in Derby city centre, which has been pre-let to the University of Derby for a term of 30 years. 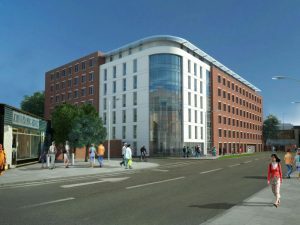 The development will comprise 350 ensuite bedrooms, arranged in cluster flats with communal living areas, as well as a laundry, management office and bike storage and will be operated by the University’s own brand, “Derby Student Living”. It was granted planning consent in March this year. The 0.234 ha (0.6 acre) site is located on Cathedral Road in Derby city centre, opposite the Queen’s Leisure Centre, and is part of the Cathedral Quarter. The development has been designed to be sympathetic to its historic surroundings while making the most of the urban regeneration opportunities redeveloping this former car park site affords. Gavin Barry, CEO of Prosperity Capital Partners, said: “This site is being developed first and foremost with students in mind. It will be a sought after term-time base for students from the UK and abroad, offering well-specified, market-leading accommodation close to the heart of the city, with leisure and retail facilities within easy reach. Mike Stares, CEO of London and UK Property, said: “London and UK Property source and develop high quality residential and commercial properties throughout the UK. We are pleased to be partnering with Prosperity Capital Partners in this exciting project in the City of Derby. Hari Punchihewa, Deputy Chief Executive and Finance Director of University of Derby, commented: “We are pleased to announce that the University will be taking on the lease of this fantastic new student accommodation development. It is vitally important that our students have access to modern, high-quality accommodation and this new property will provide not only comfort but also close access to the city during their time at University. The scheme has been designed by GT Architects and is being built by Leicester-based contractors, DW Hicks. Completion is planned for the start of the 2016/17 academic year.